Other umpire equipment (not ODUA Hats) are available at Ump-Attire, Honig’s, and many others. Black Hat: This is the mandatory hat to be worn. When wearing shirts with black trim on the collar and sleeve, the black ODUA hat must be worn. This hat is offered in 4, 6, or 8-Stitch. If you are looking at purchasing only one hat for both plate and base, then it should be the 6-stitch. ODUA recommends that you should wear “Base” pants while on the bases and “Plate” pants when working behind the plat. “Combo” pants are not recommended by the Association. New pants purchases should be the “Smitty” Charcoal Gray or a Honigs Charcoal Gray. These type of pants are available at most all umpire suppliers, including The Official Call (www.theofficialcall.com). It is preferable although not required to match your partner’s pants color. A black belt is the only acceptable color. There are several varieties of belts and are available at either Gerry Davis or Honigs. 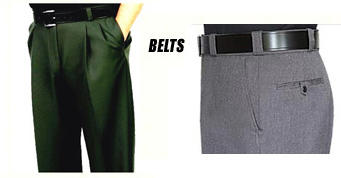 A 1.75″ wide belt is recommended for plate pants, while the 1.50″ wide belt could be worn on the bases. High gloss or patent leather belts are acceptable. Black and Light blue with Black collar trim are the preferred two shirts for ODUA. For youth games, other colors may be worn as long as you match your partner. The VHSL logo’d shirt must be worn for high school assignments and, at this time, is not available in the black shirt. 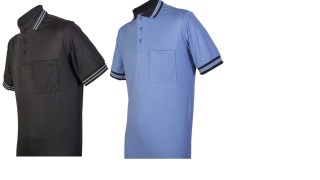 A black undershirt should be worn under the Black or Light Blue “Preferred” shirts above. 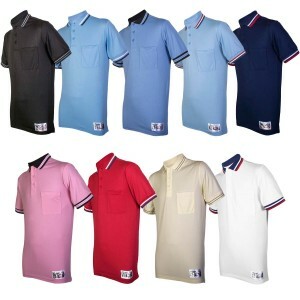 For all other color umpire shirts, the under shirts should match a color in the collar trim of the shirt. ODUA umpires SHOULD NOT wear navy blue umpire shirts. Contact Mark Halstead if you wish to purchase official Old Dominion Umpires t-shirts. Base and plate shoes may be purchased through various suppliers. Umpire shoes should be predominantly black but may have white on them. Base Shoes: Black with a minimal amount of white trim. Other shoes, such as sneakers, baseball/soccer cleats are not acceptable. Having some form of “studs” on the bottom of the shoe is recommended but not essential. Plate Shoes: Black with a minimal amount of white trim. For your own well being they should have at least a metatarsal plate and steel toe. Plate shoes are a big expense, but something that is absolutely essential in umpiring. Two ball bags are required. Black ball bags are worn with black hats and shirts with black trim (see hats). 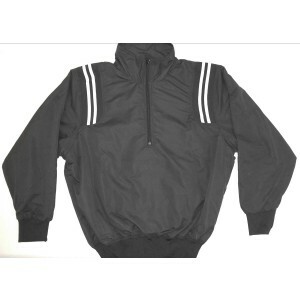 The preferred jacket of the Old Dominion Umpires Association is the black jacket with white “over the shoulder” stripes. The “non-stripe” version “Smitty” with zip off sleeves is acceptable. In a two-man umpire system, the plate umpire may wear a shirt and the field umpire may wear a jacket if so desired. In a three-man umpire game, the same applies, but the two field umpires should try to match. However, staying warm is the first priority. 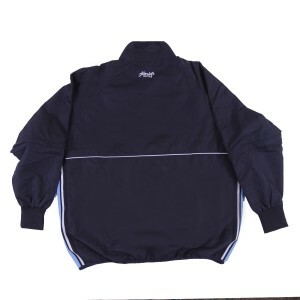 Do Not wear your uniform shirt underneath your jacket or plate coat. The piece of clothing directly under your jacket should be black. Turtlenecks or Mock Turtleneck are recommended, while t-shirts may also be worn when the temperature is not as cold. Contact Mark Halstead to order blank Mock Turtlenecks or Mocks with the official ODUA embroidery on them.